How many people have looked at a map of the Highlands and been intrigued and yet, at the same time, felt excluded by the wealth and strangeness of the place names recorded? 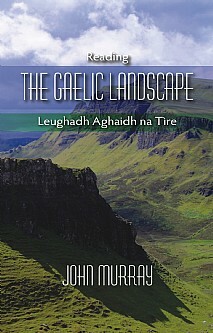 Reading the Gaelic Landscape is a must for anyone who is interested in the Scottish Highlands and its ancient tongue. It will encourage people to read and understand the seemingly obscure Gaelic words, and also provides an insight into landscape history. The text will enrich the experience of walkers, climbers, sailors, bird watchers and fishers by sketching the Gaelic context where they enjoy and pursue their interests. Outdoor enthusiasts will no longer struggle with unfamiliar spellings and words as they will acquire a new dimension of place through an understanding of place names in the Highlands. Enough knowledge about pronunciation and Gaelic grammar is provided for readers to enable them to pronounce names, so that a native speaker can understand them. Sufficient grammar is given to help the reader see the different forms of words, which occur in various combinations in place names. The vast linguistic resource of place names written in an endangered language would also be opened up to learners and schoolchildren in Gaelic medium education who would be able to broaden their vocabulary beyond what is normally taught, and reacquaint themselves with their rural heritage. The book takes a unique and comprehensive approach, as it expands and categorises current place name vocabulary and provides commentaries on Gaelic ecology, culture and landscape between each section. There is also a comprehensive index, which directs readers to examples of different name types which are grouped according to whether they describe plants, animals, physical or man-made features. Specific themes explored include how Gaelic poets like Sorley MacLean and Duncan Bàn MacIntyre used Highland landscape symbolically in their work. The lyrical tradition of the shieling and Fingalian legend is connected in this way as well. Place names are also used to speculate about species extinctions and the history of the mythical Caledonian Forest. Readers will learn about diverse aspects of place and how these have been recorded, through a deeper understanding of a language, specific to the landscape of the Scottish Highlands and unique in its perception of that landscape. In the past, Gaelic place-name publications have tended to emphasise the needs of climbers and walkers and concentrated on hills and mountains. However, this book intends to cover a wider territory and attract a more diverse readership and so enable a more comprehensive reading of the landscape.